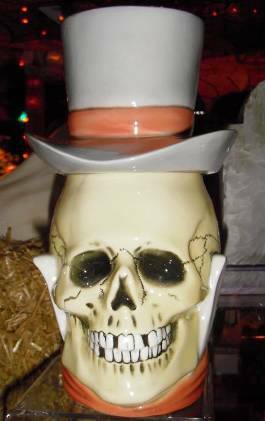 Yard of Ale.- An English “for merriment” glass drinking vessel usually held in place by a wooden stand. 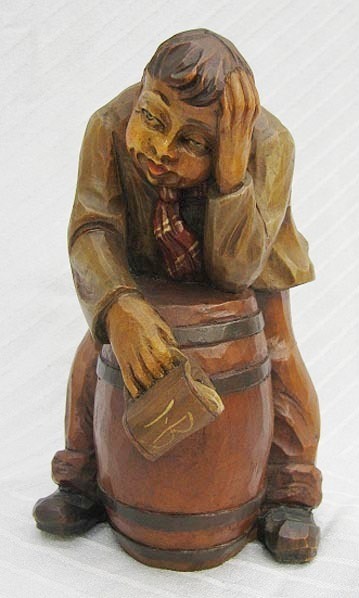 With a large bulbous end; the trick is to drink it fully without all the ale / beer coming out of the bulb at once and landing in the drinker’s lap. 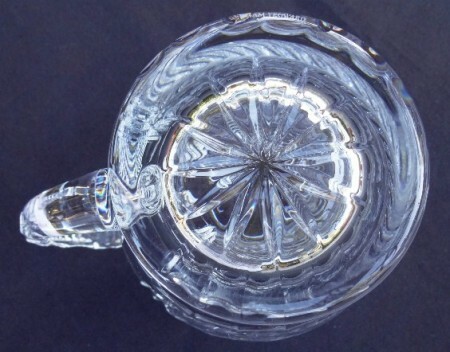 These vessels come in smaller sizes for the less experienced. Yellow ware – American and British – Yellow ware had a long period of manufacture, beginning with British-made wares in the late eighteenth century. North American production began shortly thereafter and firms in both locations made yellow ware well into the first third of the twentieth century (Ketchum 1987:13; Gallo 1975:8, 10)1. Most pieces do not bear manufacturer’s marks, so determining a vessel’s age is often a matter of decorative details or vessel form. 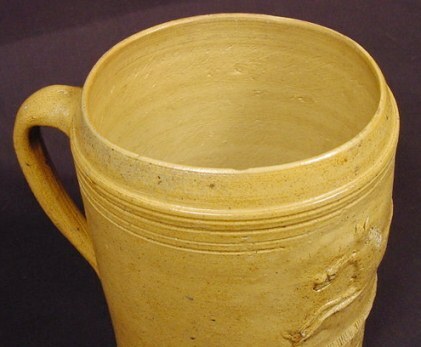 ▼American yellow ware beer mug, dated 1801. 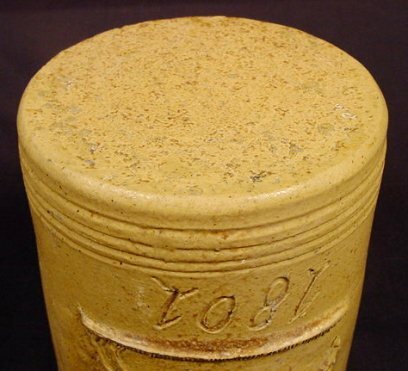 British Yellow Ware The earliest British yellow ware production began in Glasgow, Scotland or the English Yorkshire region, in the last several decades of the eighteenth century (Gallo 1985:10). These areas, with their good deposits of yellow firing clay were ideal for yellow ware production, which soon spread to Derbyshire and Wales (Gallo 1985:10-15). As was true for North America as well, many manufacturers of yellow ware also produced Rockingham wares. Yellow wares were imported from Great Britain into the United States, especially before the North American yellow ware industry took off. North American Yellow Ware In the United States, potteries producing yellow wares were established primarily by English potters who had gained experience in the Staffordshire district (Goldberg 2003). Yellow ware potteries sprang up in areas with good deposits of buff colored clay; the main centers of manufactory were in Ohio, New Jersey, Pennsylvania, Maryland and New England2 (Gallo 1985:17). North American production can be dated as early as 1797,3 but output during the late eighteenth and early nineteenth centuries was limited; the first successful production not occurring until 1828 at the D. & J. Henderson firm in New Jersey (Ketchum 1987:13-14). 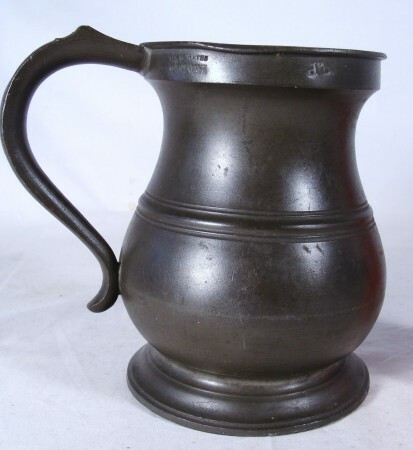 Prior to around 1850, North American wares tended to be thick-bodied and heavy (Gallo 1985:16). Yellow ware continued production in the United States into the 1930s, but tapered off after the turn of the twentieth century (Leibowitz 1985:9). East Liverpool, Ohio was a major manufacturing center for ceramics in North America and the industry there started when the first pottery opened in 1839 (Gates and Ormerod 1982:3). Yellow ware and Rockingham were the first wares produced in East Liverpool and continued to be the majority of East Liverpool’s output prior to 1872 (Gates and Ormerod 1982:5, 7). Trenton, New Jersey, located between two large consumer markets—New York City and Philadelphia—was also an important center of yellow ware production. Trenton firms producing yellow wares included the Speeler Pottery Company (1871-1879), the Excelsior Pottery (est. 1857) and Coxon & Company (est. 1863) (Goldberg 2003:31; Leibowitz 1985:36; Liebeknecht 2003). Baltimore was the major center for the southern production of yellow ware. The Edwin Bennett Pottery Company operated between 1846 and 1936 (SIRIS), although the manufactory focused primarily on white-bodied wares after around 1870 (Leibowitz 1985:73). Another Baltimore firm, the Chesapeake Pottery, was established around 1880, producing yellow ware and Rockingham (Barber 1904:148). This pottery operated under a series of names, including Haynes Bennett and Company (Barber 1904) and D. F. Haynes and Son (Lehner 1988:89). 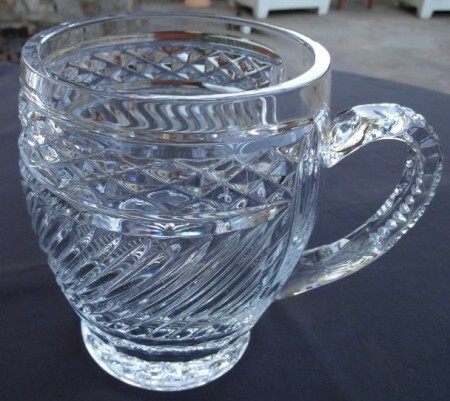 Yeoward, William – Modern day maker of quality crystal beer mugs in the Old Bohemian style. See the flattened section on the top of the handle, there to accommodate a lid. ▼ Detail of wheel cut star base. 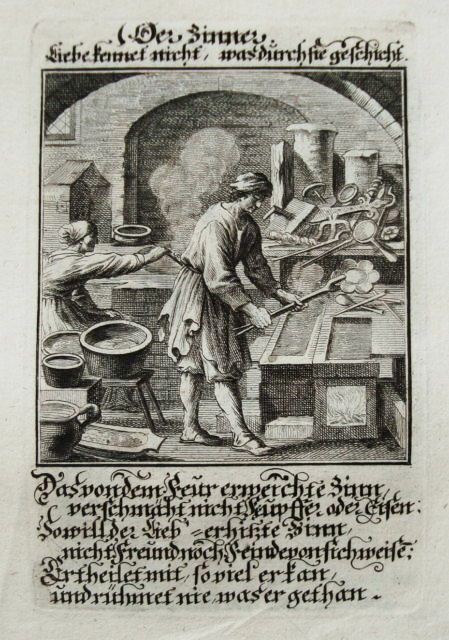 Zinnschmied – German for pewter-smith. Zinnteller – German for pewter plates and chargers. Zirkel – These symbols found on “Student steins” are based on letters of the alphabet, but they are combined in a unique flowing script, with the letters intertwined. In many cases the Zirkel is made from one unbroken pen stroke, although that is not the case with the Zirkel shown to the right. The first letter of the association name (e.g., Bavaria) may be used as the basis for the symbol, or the University name may be used (e.g., RC for Ruprecht-Carls-Universität of Heidelberg). The letters c, v and f are always included, sometimes in obvious fashion (like the f and the v in the Zirkel to the right), othertimes only by suggestion or visual suggestion, as the c-shape in the vertical stroke to form the B. These letters stand for the Latin words crescat, vivat and floreat, or grow, live and flourish. An exclamation point also frequently appears, representing the Latin symbol for eternity, expressing the enduring bonds of brotherhood and fraternity. 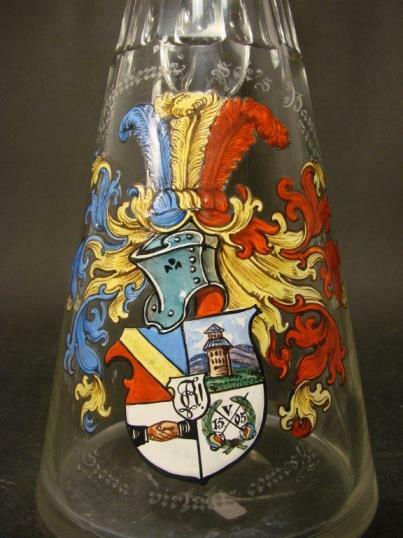 ▼ The “zirkel” is shown on the shield of this student stein made for a member of the Concordia Corps, in Coburg. 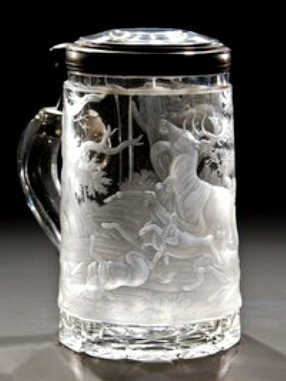 Zoeller and Born – A family owned operation that has been producing beer steins since 1956. 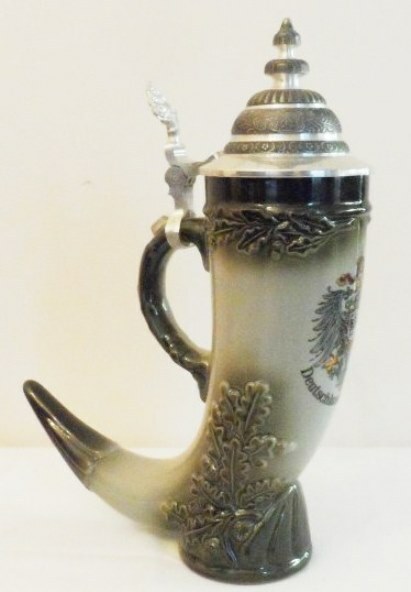 ▼ 11 inch high beer stein (horn) handcrafted in Germany, showing the Deutschland (Germany) eagle holding the German flags. Zsolnay. 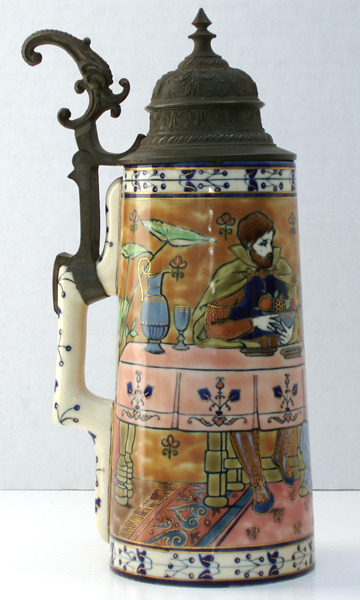 Pecs steins – Made in Hungary. 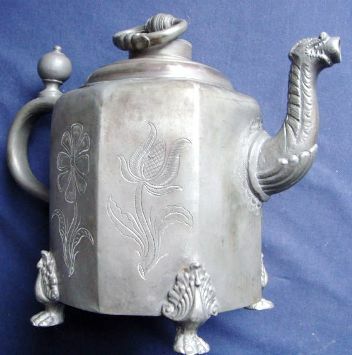 These usually come with a with sort of a Isnik influenced designed handle ~ as shown. ▼ Pottery. Circa 1880 – 90. Zum Andenken – German for “In remembrance of…” Shown: A one liter blown glass, Bohemian Beidermeir style, circa 1830, with gilded engraving.